Experience the pre-1840s fur trade era at the 44th Annual Horse Ridge Rendezvous on February 20-24, 2019 at the Cowgirl Hideout Ranch about 19 miles east of Bend, Oregon. For five days on the last full weekend of February, the calendar will be turned back more than 160 years, when the Grizzly Mountain Longrifles, a Prineville group of muzzleloader shooting enthusiasts, holds its annual Horse Ridge Rendezvous. 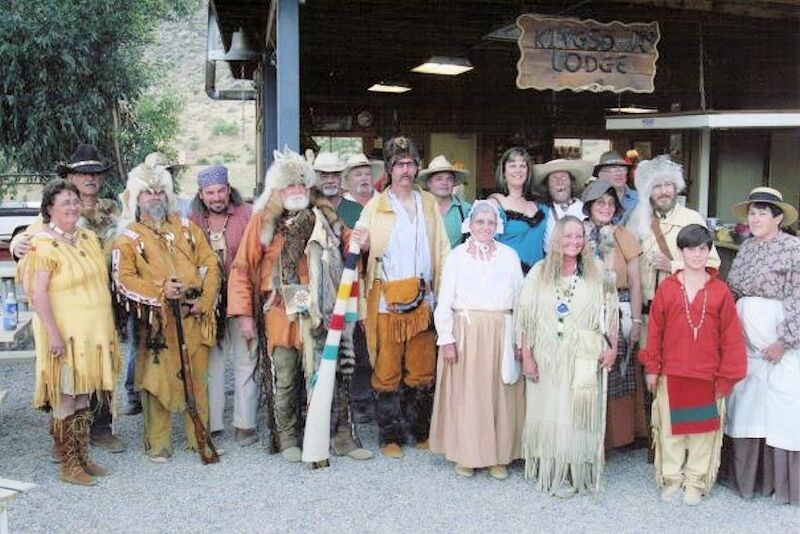 The Horse Ridge Rendezvous will attract several hundred shooters from throughout Oregon, and even from other states, and in the tradition of the pre-1840 mountainman era, most will be clad in buckskins, furs, calico, and other period dress. Shooting events include trail walks, where shooters walk a trail, pausing to shooter at each marked target. Targets are gong-type targets, scored as either a hit (gong!) or miss. There’s a Pee Wee division for those 11 years old and younger, Juniors ages 12 through 16, and adults in both men and women classes. There are flintlock, percussion lock and trade gun (smoothbore) divisions. Includes Camp Fee, Rifle, Pistol, Hawk & Knife Competition. A popular special event is the Long Gong shoot, where each shooter takes one shot at a gone hanging maybe 100 yards away. Those who miss are out. Those who hit then move back a few yards and shoot again. This continues, with each round being shot at a longer distance, until all but one are eliminated. The “Fort Shoot” requires four-man teams, all shooting at stand-up targets (bowling pins and lengths of well casing), placed at various distances. The winning team is that which knocks down the most targets in 15 minutes. There are events for muzzleloading shotguns, pistols, shoots for squirrel guns (.45 caliber and smaller), tomahawk and knife throwing, and other activities. “Trader’s Row” is a popular area in the camp, where vendors display and sell just about anything related to the pre-1840s mountainman era — hides, furs, beads, guns and accessories. Although this is mainly a muzzleloader shooting competition, it is a great opportunity for anyone wanting to get involved in muzzleloader shooting to see what it’s all about — or just enjoy the period dress and fun. Mark your calendar today so you don’t miss the next Horse Ridge Rendezvous on the last full weekend in February (Wed-Sun) east of Bend, Oregon.